the finished product through the viewing window. Recent changes in federal privacy laws have created new responsibilities for business, financial firms, and health care providers to protect customer, client, and patient information. You may now be legally required to implement safeguards for much of the information you use to conduct business. 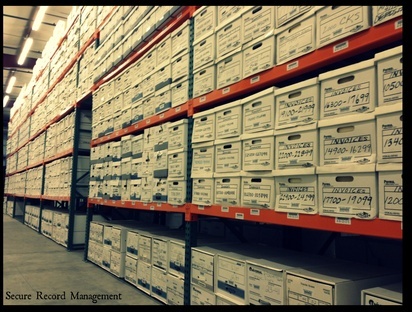 Simply saving and storing important documents may no longer satisfy federal requirements. In some cases, retaining documents may even increase your personal and business liability. When your business documents have reached the end of their life cycle, you must ensure secure disposal of the confidential and sensitive information to remain in compliance with government regulations. Our focus is to provide a secure destruction service via locked containers that are secure and cost effective. 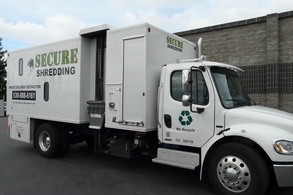 Our secure destruction service assures that confidential and sensitive documents are destroyed prior to the recycling process (it has been found that recycling without prior destruction provides ample opportunity for unauthorized retrieval of confidential and sensitive information). Once destroyed, the material is compacted and mixed with other destroyed information, making it virtually unidentifiable. The combination of security containers and	confidential destruction provides an unbroken chain of custody.